Introduction A number of breast cancer risk prediction models have been developed to provide insight into a woman's individual breast cancer risk. Although circulating levels of estradiol in postmenopausal women predict subsequent breast cancer risk, whether the addition of estradiol levels adds significantly to a model's predictive power has not previously been evaluated. 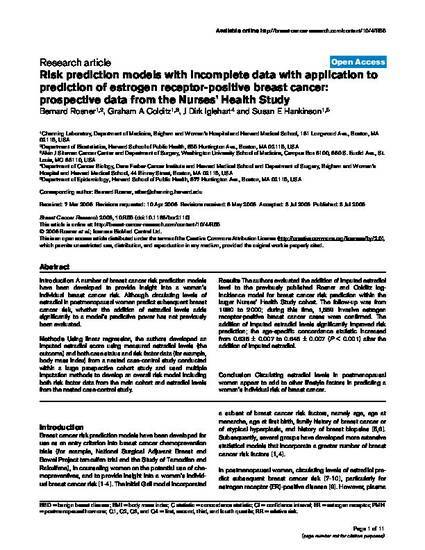 Methods Using linear regression, the authors developed an imputed estradiol score using measured estradiol levels (the outcome) and both case status and risk factor data (for example, body mass index) from a nested case-control study conducted within a large prospective cohort study and used multiple imputation methods to develop an overall risk model including both risk factor data from the main cohort and estradiol levels from the nested case-control study. Results The authors evaluated the addition of imputed estradiol level to the previously published Rosner and Colditz log-incidence model for breast cancer risk prediction within the larger Nurses' Health Study cohort. The follow-up was from 1980 to 2000; during this time, 1,559 invasive estrogen receptor-positive breast cancer cases were confirmed. The addition of imputed estradiol levels significantly improved risk prediction; the age-specific concordance statistic increased from 0.635 ± 0.007 to 0.645 ± 0.007 (P < 0.001) after the addition of imputed estradiol. Conclusion Circulating estradiol levels in postmenopausal women appear to add to other lifestyle factors in predicting a woman's individual risk of breast cancer.